ParaNorman is a movie that works because it pleases people of just about every viewpoint. We have horror movie allusions of both subtle and obvious varieties, beautiful animation, clever jokes, and a message of acceptance that’s not too preachy. It caters to anyone that may be even remotely interested in it, and what it creates has certain moments of great cinema. While at school, Norman is confronted by the ghost of his possibly insane uncle, Mr. Prendergast (voice of JOHN GOODMAN), who had died the day before, shortly after telling Norman that he could also see ghosts. Prendergast desperately informs Norman that tonight is the 300th anniversary of the time several witches were executed in their town, and that it is necessary to read at their graves from an old book to keep the dead, well, dead. It is now up to Norman to do this. It’s not easy – what starts out as a fairly straightforward mission turns into an event with Norman, Neil, Alvin, Neil’s jock brother Mitch (voice of CASEY AFFLECK), and Norman’s sister Courtney (voice of ANNA KENDRICK) escaping ruthless zombies. How the film gets here and what happens afterwards is part of the brilliance that are the storyline and details within ParaNorman. What I found most attractive about ParaNorman is how it takes an effectively simple and arguably overdone plot (people who are different should not be persecuted and stigmatized purely because they are different) and handles it in a thoughtful and more original way. There’s a lot more to this than is usually contained in a kid-targeted animated movie. Screenwriter and co-director Chris Butler isn’t afraid to add depth to the message within. On a more aesthetic note, added are horror references of every kind – a scene that mimics the production design from Night of the Living Dead (Romero, 1968), a score from Jon Brion with an occasional horror-synth backdrop, and just little things all around. The 92 minute movie retains a creepy atmosphere nearly entirely throughout thanks to the fantastic visuals. The meticulous stop-motion animation is enhanced with eccentric set pieces and just right lighting. My only real complaint with ParaNorman would be how a movie that is otherwise anti-formula in the field of children’s movies can occasionally slip into the predictable and expected moments – cringing was an appropriate reaction towards the end when a speech is given that outlines the entire message of the movie. It is my experience that most kids would be able to pick up the message without a moment so obvious. I can think of ways that this point could have been made in a more subtle manner. 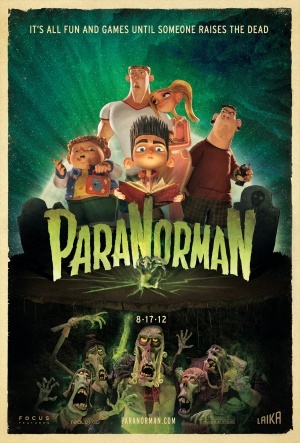 ParaNorman is otherwise a very good movie – with stellar voice acting, it’s a movie that actors want to be a part of. With tight plotting and legitimately funny jokes, it’s a movie that writers write when they obviously care about what they’re doing, and with breathtaking visuals, it’s a sign of true artisanship from artists and technical workers.